I’ve actually had the Gripstand for over a year now, so I have had ample opportunity to put it through plenty of paces with a variety of devices in a lot of use cases. It has been up to the task at all times, and is by far and away the most versatile device stand that I’ve ever used. Its combination of versatility, portability, and quality constructions means it has a permanent place in my mobile gear bag. 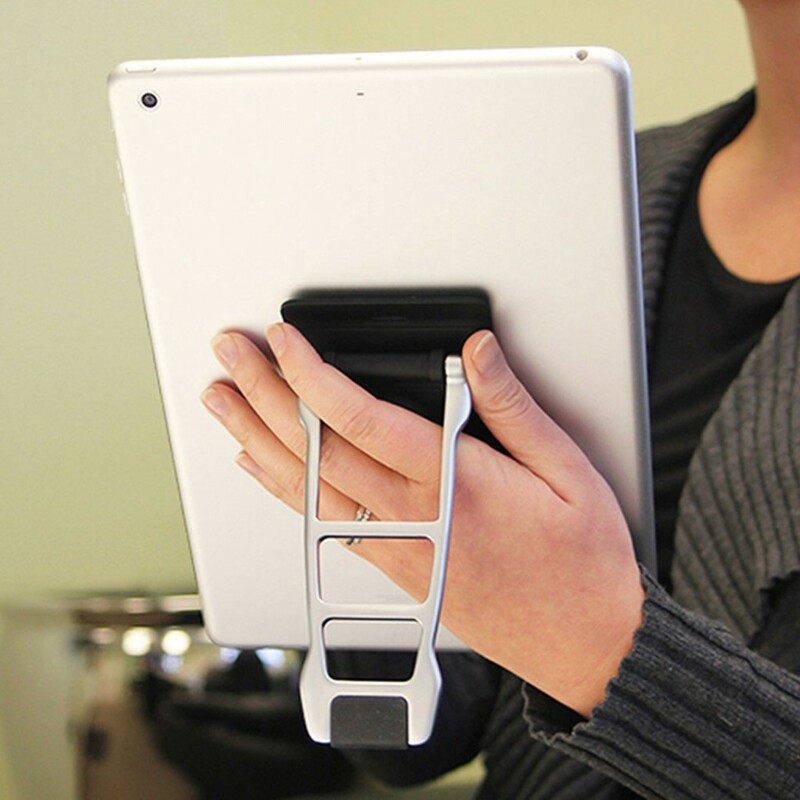 The Gripstand lives up to its name thanks to its innovative microsuction grip pad. The stand comes with a thin vinyl cover that protects the pad when not in use. Simply peel the cover off, and then firmly press and hold the microsuction pad to the back of your chosen device to be sure it is securely attached. 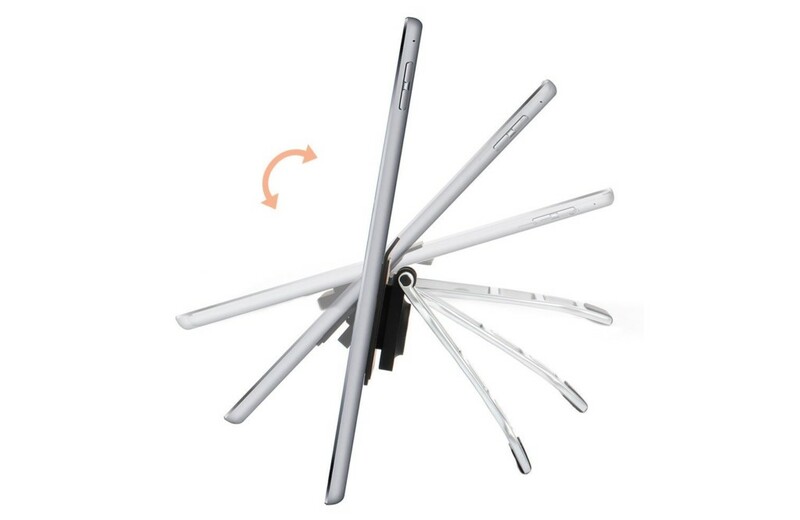 When you are done using the Gripstand, simply peel it back off of your device, holding the flared edge at the top of the base, and re-attach the vinyl cover to protect the microsuction pad. The pad sounds similar to adhesive when removing from a device, but rest assured it is not. That is just the suction releasing as you put pressure on it. Because it relies on suction, the Gripstand can be attached and removed as often as you like. Again, I have been using it for over a year, and it is still working great for me without any degradation in capability. The only issue that I have run into was that the microsuction pad will incrementally pick up dirt and debris from the back of your devices. To remedy this, just wash the pad with water and gently wipe away any attached debris. Once the pad dries, it is ready for action again. I have only had to do this two or three times since I’ve had the Gripstand. Another of the standout features of the Gripstand is also revealed in the name- 360, as in 360 degrees. Since the hinge for the support arm is located at the top of the base, it has a full 180 degrees of motion, and the hinge has enough resistance to hold its position where you locate it. This gives you complete control over your device’s viewing angle. The 360 degrees actually comes from the rotating base that the support arm is attached to. The base can rotate all the way around, locking into place at 45 degree intervals. 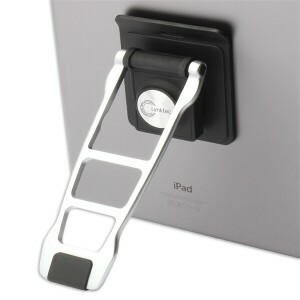 This gives you the flexibility to change the position of you device without having to detach and re-attach the stand. For example, you can go from watching a movie in landscape mode on your tablet to reading a document in portrait orientation by simply rotating the support arm around. The feature of Lynktec’s 360 Gripstand that really puts it over the top for me is its versatility. It will work with almost any tablet or smartphone. In fact, what you can stick it to is really its only limitation. There are certain device cases and types of surfaces that the pad does not adhere very well to. On its product page, Lynktec states that works best with smooth surfaces, and that it isn’t suitable for use with textured surfaces or cases. I can say from my experience that the Gripstand works great in most circumstances. I have used it with three different Android tablets that have either soft-touch plastic or finely textured hard plastic backs. In all three cases, the Gripstand microsuction pad worked just fine. I can also say that it works perfectly with my clear iPhone 7 Plus case, and I never had any issues with previous devices, such as the iPad Mini or a 9.7″ iPad Air 2. The only device I have had any issues with is my 12.9″ iPad Pro, however this is only if it is in the cover that came with my ZAGG Slimbook Keyboard Case. At 12.9″, it is definitely on the large size for a stand this size. However, the Gripstand will actually hold it just fine without the case at typical angles for viewing content. I wouldn’t trust the Gripstand to hold a 12.9″ iPad Pro at an angle suitable for typing on the screen, because all of the weight of the devices, plus the pressure of your typing are bearing down on it. However, I see that as less of a shortcoming of the product than a legitimate limitation based on the size of the stand. Considering that smartphones are growing in size and that there are more of them than tablets out there, the size of the Gripstand is likely just right, even if it isn’t perfect for the large iPad Pro. 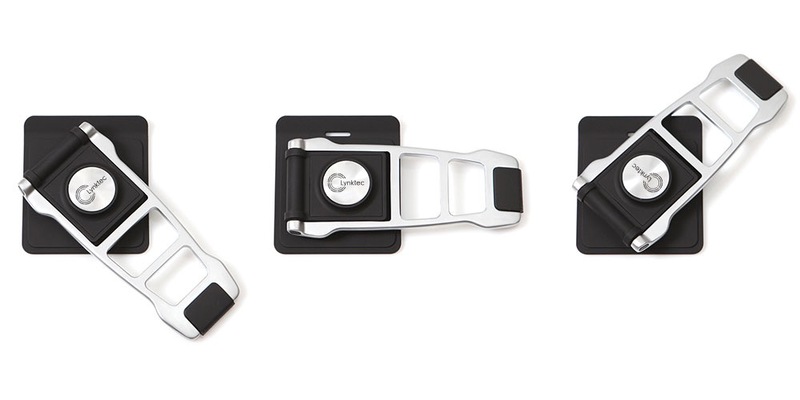 Another aspect of the 360 Gripstand that wins it points for versatility is its portability. 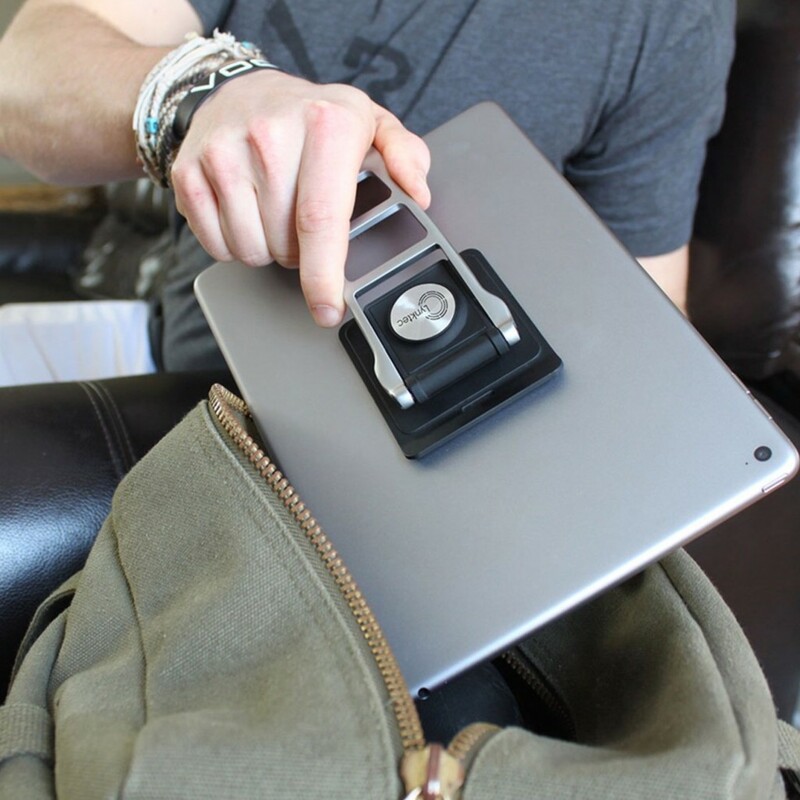 Because it uses the microsuction pad for attachment, there is no extra folding cradle or bulky hardware to hold your devices. There is just the pad and support arm and no extra bulk or fluff. The plastic of the base and aluminum of the support arm are sturdy, but lightweight, and the Gripstand folds flat, easily fitting in a purse, cargo pocket, or gear bag. There really isn’t a drawback to the Lynktec 360 Gripstand that I can find. It will work for the majority of smartphones, tablets, and e-readers, and considering its innovative design and quality construction and versatility, is priced appropriately at $39.99. 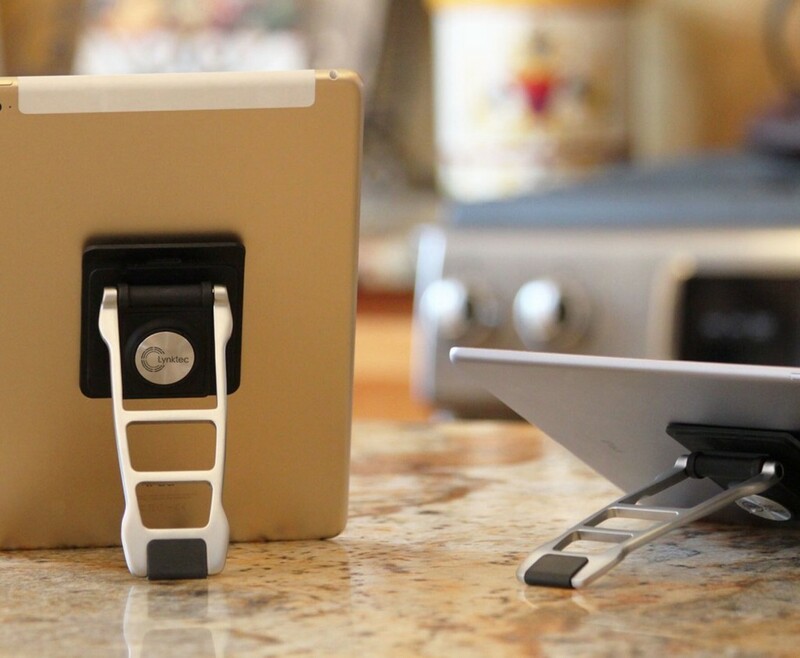 About the only thing left to say is, If you are looking for a device stand, start here. As long as your device doesn’t have a uniquely textured back, or you don’t use a case that the microsuction won’t adhere to (and you aren’t willing to remove on occasion), then the 360 Gripstand should meet your needs. The Lynktec 360 Gripstand is available from Lynktec’s site (Here), or from their Amazon store (Here). 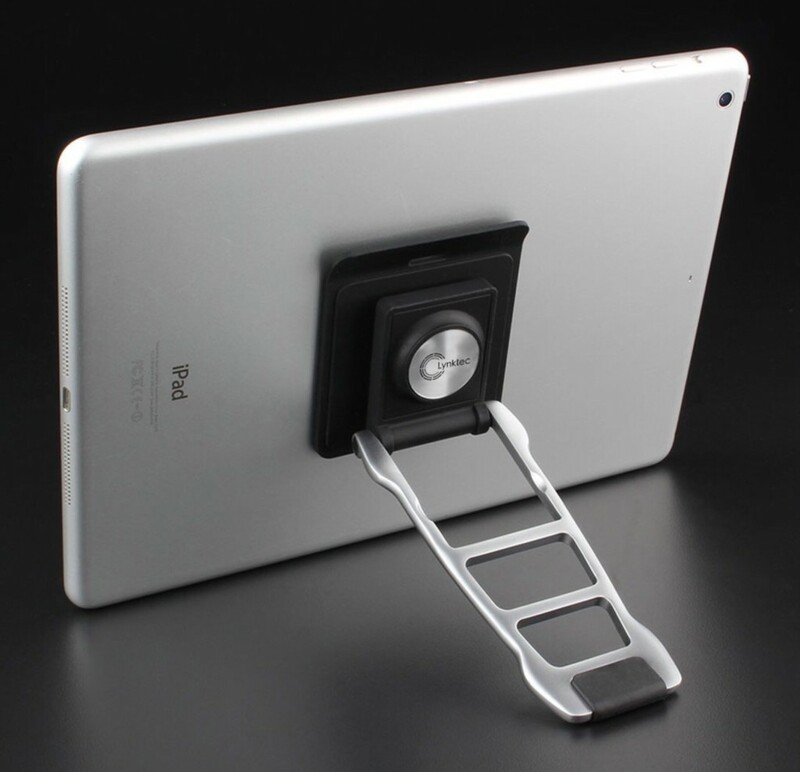 The 360 Gripstand was provided for review on iPad Insight by Lynktec. For further information regarding our site’s review policies, please see the “About” page.